There are plenty of options that come to mind when thinking of the quintessential Chicago street. Unless you live nearby, we're betting Irving Park Road isn't the first to come to mind. However, consider just where it can get you. Starting in the east at Lakeshore Drive, the busy road (also known as IL Route 19) daggers through the likes of Lakeview, Northcenter, Albany Park, Old Irving, and Portage Park, to name a few. 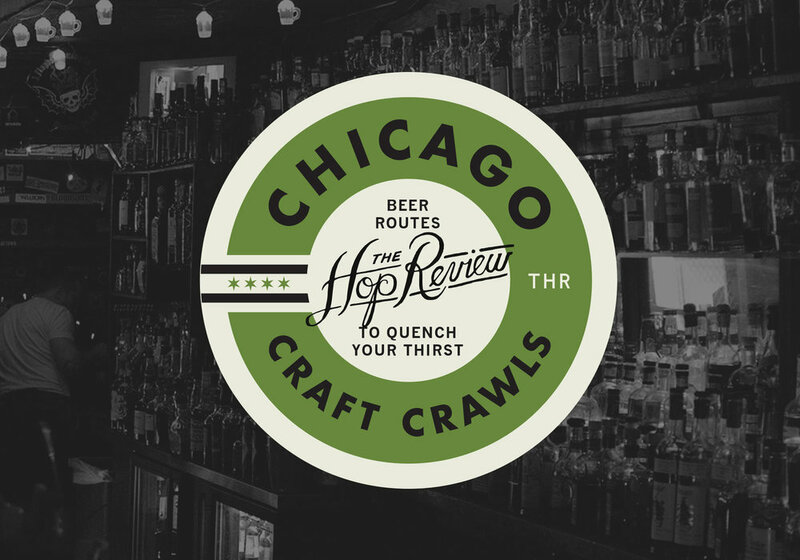 It also passes three L lines, making it an easy stopping point for anyone wanting to jump into our Craft Crawl. During our afternoon bar hopping, we quickly discovered how easy it is to find a quality beer along Irving Park in one of the fine bordering neighborhoods. From our first stop in Buena Park to our final stop near the Kennedy, we discovered a wealth of craft beer at incredibly diverse locations. From sleepy neighborhood hangouts to coffee shops brewing beer, there's a lot to love on Irving Park Road. The Bar on Buena might be one of the city's most underrated craft beer joints. From the people who would eventually bring us craft staple Fountainhead, the BOB has long curated an impressive, ever-changing beer menu. You'll always find something here you've never had and won't have a problem matching it up with some of their fantastic pub grub. We'd recommend checking it out on a warm summer day and grabbing a table on their quiet curbside patio. Our choice on the patio: Weissenheimer Hefeweizen from Destihl. The surprise of the afternoon definitely goes to Greenstar Brewing, hidden discretely inside the respected Uncommon Ground cafe. We're betting the average Chicago craft beer geek doesn't know this place exists, and Greenstar don't seem too worried about that. Once inside though, the friendly staff were happy to talk shop and we found all of their beers to be delicious and approachable. We'd recommend their IPAs, so a flight might be the best approach to get acquainted with this hidden gem. Our pick at the bar: Greenstar's Spaceship IPA. Recently renovated, The Long Room has long (pun intended) been a go-to spot for craft beer lovers. But did you know they have an awesome back patio tucked away from the noisy intersection out front? Did you know they serve gourmet coffee and breakfast, lunch, and dinner from their kitchen, Sidecar? We visited on the one day the kitchen was closed, so they had free Bang Bang pie. Sound like a good space? Yea, we thought so. Grab a table out back or at one of the many stools dotting the inside bar. Our pick for the patio: Greenwood Beach from Temperance. Begyle is one of those Chicago breweries with a serious packaged goods presence around the city. But, you may not have drank their beers from the source. Thankfully, with the addition of their new taproom, you can now spend time there over several pints instead of just their previous taster portions. Tucked away on sleepy Cuyler Ave., around the corner from the Brown Line stop, you'll find their modest brewery front. Wander inside, and you'll find a sleek bar and plenty of polished concrete. And a plenty friendly staff ready to pour. Possibly our most unconventional inclusion to our list is Resi's Bierstube. Will you find a menu spattered with local craft options? Nope. Will you find a menu full of German lagers and weissbiers you've maybe never heard of? You bet. And that, for us as well as many fans of Bavaria, make Resi's a must-visit. Aside from an interior untouched since the 1960's, they're housing one of the city's best kept secret biergartens out back. Think "grandma's backyard." With one final push down Irving on the #80, our Craft Crawl culminated at the well respected Independence Tap. By now you're possibly waning, but we assure you this bar is worth the extra push. A classic Chicago corner bar, Independence greets you immediately with an airy bar, plenty of drafts and one impressive can/bottle list. We happened to drop during their 20th Anniversary party, and plenty of friendly folks were enjoying the space. In short, this place has staying power. Near the 90-94 overpass and a stone's throw from the Blue Line, you can make this your bar-on-the-way-to-ORD, too. Not bad. Our beer at the bar: Liberty Ale from Anchor Brewing. Newer PostBeer & Branding: Atlas Brewing Co.